Mix, blend and more like a pro with this KitchenAid commercial-quality 600 stand mixer. High-performance motor has direct-drive, all-steel gears. Six-quart stainless steel bowl with a contoured handle. Professional bowl lift design provides stable mixing. Soft Start feature helps prevent ingredient splash-out. 14-cup Flour Power gauge selects correct power/capacity. PowerKnead spiral dough hook rolls thick, heavy dough. Flat beater with 67-point mixing action. Wire whip covers 134 points to increase airflow. 10 mixing speeds make it perfect for any recipe. 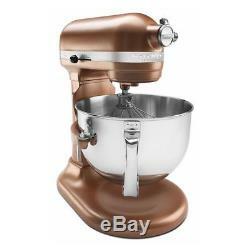 The item "New Kitchenaid Pro 600 Stand Mixer 6qt Super Big Large Capacity Copper Pearl" is in sale since Tuesday, December 11, 2018. This item is in the category "Home & Garden\Other Home & Garden". The seller is "gwol9874" and is located in Framingham, Massachusetts. This item can be shipped to United States, Canada, United Kingdom, Denmark, Romania, Slovakia, Bulgaria, Czech republic, Finland, Hungary, Latvia, Lithuania, Malta, Estonia, Australia, Greece, Portugal, Cyprus, Slovenia, Japan, Sweden, South Korea, Indonesia, Taiwan, South africa, Thailand, Belgium, France, Hong Kong, Ireland, Netherlands, Poland, Spain, Italy, Germany, Austria, Bahamas, Israel, Mexico, New Zealand, Philippines, Singapore, Switzerland, Norway, Saudi arabia, Ukraine, United arab emirates, Qatar, Kuwait, Bahrain, Croatia, Malaysia, Brazil, Chile, Colombia, Costa rica, Panama, Trinidad and tobago, Guatemala, Honduras, Jamaica, Viet nam, Uruguay.